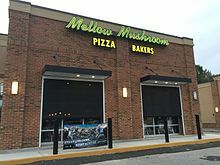 Mellow Mushroom Pizza Bakers is a restaurant chain that was established in 1974 in Atlanta, Georgia as a single pizzeria. It operates as a franchise under the banner of Home Grown Industries, Inc. of Georgia, with over 150 locations throughout the United States. Its headquarters are in Atlanta, Georgia. Mellow Mushroom restaurants specialize in pizza, but they also serve calzones, hoagies, salads, appetizers, and a wide beer selection. They often feature a large selection of beer, typically 20-40 beers on draft and 50 or more bottled. Each store is locally owned and operated and decorated differently and sometimes there is a unifying theme to the artwork. Tie-dye and colorful mushrooms are a common theme for locations. Some restaurants occasionally feature live music, trivia competitions, karaoke, or bingo. Mellow Mushroom opened in Atlanta, Georgia in 1974 when two college students from Georgia Tech, later joined by a third from the University of Georgia, founded a business that reflected their eccentric philosophies. The first restaurant was opened on Spring Street in Atlanta. In the late 1980s, the first franchise was opened by an employee, followed by customer-owned franchises, and then to friends of employees and customers. Each franchise is locally owned and operated with its own unique feel. The first franchise to be located outside of Atlanta was in Athens, Georgia, near the University of Georgia. That store renovated a former Wendy's and was open until 2006. In the summer of 2007, it relocated to Clayton Street in downtown Athens. There are several dozen locations operating in Atlanta and elsewhere in Georgia. Beginning in 2000, the franchise expanded outside college markets to urban areas such as Jacksonville, Florida and Denver, Colorado. The chain has over 200 locations across 20 states. The visual identity of Mellow Mushroom Pizza was defined during their early franchising phase by Atlanta artist Buddy Finethy. Finethy created and refined the signature cast of characters that identified the chain. The first Mellow Mushroom restaurant was shown on the S:01 E:02 of The Dukes Of Hazzard. ^ Billotto, Heidi (11 June 2003). "Mellow Mushroom Restaurant". WSOCTV.com. Archived from the original on 26 July 2011. ^ a b "Contact Us". MellowMushroom.com. Archived from the original on February 4, 2012. Retrieved February 20, 2012. ^ a b c Bard Brutzman, Anna (April 1, 2011). "Honea Path Native Gives Pizzeria Its Mellow Touch". IndependentMail.com. Archived from the original on December 17, 2014. Retrieved October 7, 2016. ^ "About Us". MellowMushroom.com. Archived from the original on 2007-10-18. Retrieved 2007-10-24. This page was last edited on 2 April 2019, at 00:51 (UTC).